Wall mounted game Roadrunner. Children will love this new range of wall mounted games. 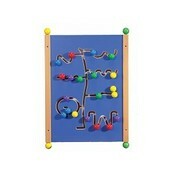 Made of high quality wood and perfect for waiting rooms, receptions, kids corners and play areas. 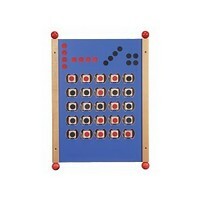 This product is new in our attractive range of wall mounted games. 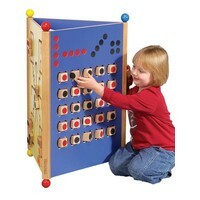 When playing with this wall mounted game, kids will move the 5 brightly coloured balls around the board. This exciting game is suitable for play corners, waiting rooms, incoming areas and anywhere where children are waiting or looking to be amused. This wall mounted game "Roadrunner" is a brilliant eye-catcher with its massive wooden balls. 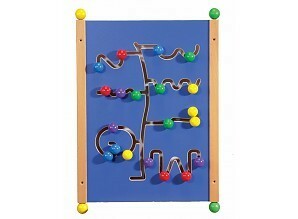 This solid wooden wall mounted game is made in Germany and represents a closed system without any loose elements. It is made of scratch-resistant MDF wood and supplied with stable distance holders to be fixed on 4 points. 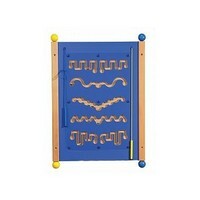 Since 2 different wall games are also available ("4 in a row" and "magnetic rallye", see below), you can even line up several wall units together for a spectacular kids corner.